Hall Franktechniek Team, kann man einen DCF 77 Empfänge .. 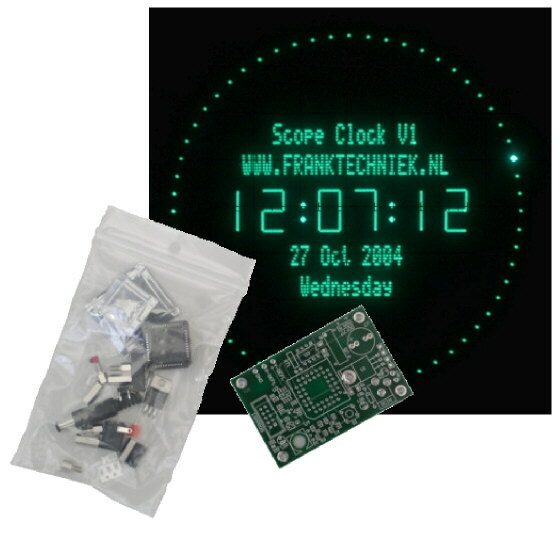 Kit for an Oscilloscope Clock. Connect this clock to the 'x' and 'y' inputs of any regular oscilloscope and a real working clock will be displayed on the CRT tube. A very special kit indeed! Kit contains all parts, preprogrammed processor and a professional doublesided printed circuit board. As an option you can install a realtime clock, to keep the time running even when power is lost. A 9V/12V adapter is recommended. See also our support site for more information on this interesting project.